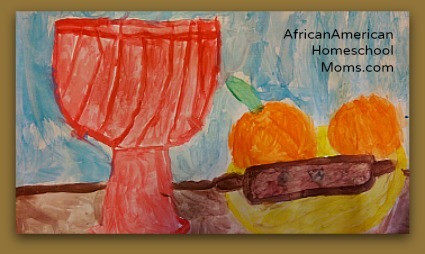 In my post, Discovering African-American Artists, I explained how I was planning to incorporate more art activities into our homeschool. One of my specific goals was to introduce the girlies to several African-American artists and have them replicate the artists’ styles throughout the year. We recently began our study by learning about the life and art of Horace Pippin, a man who found artistic subject matter in daily life, family, familiar objects, memories, and personal hardship. Pippin painted in natural colors and then added his signature splash of red to most of his works. You can introduce your children to this amazing artist using the following lesson plan. Part 1: Read about Horace Pippin. Begin your study by reading this short online biography of Horace Pippin and then reading Starting Home: The Story of Horace Pippin, Painter by Mary E. Lyons. The book is a wonderfully descriptive work that introduces readers to Horace Pippin and vividly describes the hardships he faced. Though the book is a great resource for the homeschool mom, older students will benefit from reading it as well. 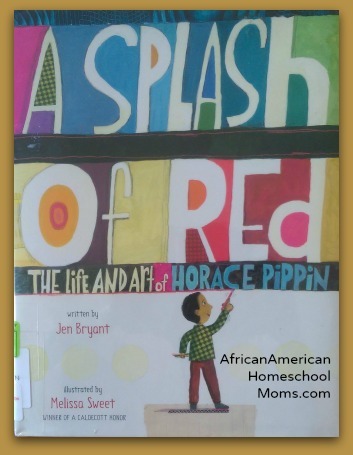 The younger crowd can also learn about Horace Pippin by reading A Splash of Red: The Life and Art of Horace Pippin a Caldecott Award winning book by Jen Bryant. This is a marvelous book for elementary school students that describes Pippin’s life and highlights his most famous works in an engaging and easy to read format. Be sure to ask questions about how Horace Pippin’s circumstances (winning the art contest, going off to war, losing the function of his arm, keeping a detailed journal, etc.) shaped his career. Part 2: Watch a video that showcases Horace Pippin’s work. Part 3: Learn about still life painting. Horace Pippin created still-life paintings. Such paintings feature an arrangement of inanimate everyday objects or natural objects such as food or flowers. Teach children more about this technique by visiting this page, Still Life Paintings and Drawings over at Art Is Fun. After your child has a firm understanding of the still life technique, visit this WikiArt page to view Pippin’s gorgeous painting, The Warped Table. Have your child study it for a bit and then talk about the characteristics of still life paintings. Part 4: Paint like Horace Pippin. Set up a still life subject for your child to paint. Remember, still life paintings often use everyday objects, so look around the house for suitable and interesting subjects. I used a simple planter (ours incorporates a great big splash red! 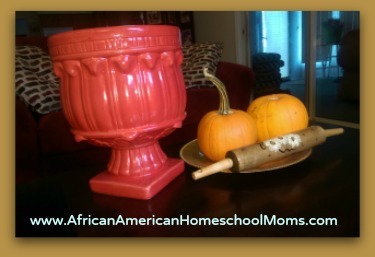 ), a couple of bright pumpkins, a golden colored plate, and an old rolling pin. 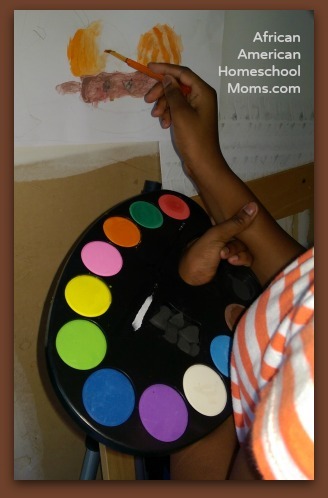 Next, set up the paper on an easel or attach the paper to a wall. Instruct children to lightly sketch the scene on a large sheet of paper. Then have them go back and use water colors to bring the picture to life. Horace Pippin lost the use of his right arm due to a war injury, but still managed to paint by using his left hand to hold up right wrist. To help the girls understand how hard it was to do this, I required them to paint a portion of their painting using this technique. Part 5: Display that gorgeous work of art! Once finished, allow your artist to display her fine masterpiece in a prominent place! I am thrilled to find your site! 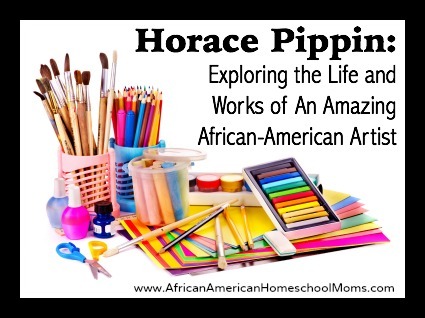 I like to supplement our rather vanilla homeschool curriculum and Horace Pippin was my next artist choice (I have Splash of Red; one of my favorite picture book bios). Your lesson plan is going to help me so much! I’m looking forward to exploring your other resources.